It's been a traveling whirlwind around here lately! Stevie and I just got back from an epic adventure in the Pacific Northwest (I can't wait to share those images with you soon!) and we zipped down to the Florida gulf coast for a long Fourth of July weekend. So I'm a little sunburnt, a little sleep deprived, and certainly thrown off from anything resembling a "normal" schedule. Yet travel renews, restores and challenges me in a way few other experiences do. A dear college friend married her sweetheart out in Arizona a couple of months ago, and we took it upon ourselves to take a few extra days to rent a car and venture down those endless, desert roads in search of some national parks and natural wonders. And boy, did we find them! Here are a few highlights from our road trip out West. From Phoenix, we set out for the little hiking town of Sedona—about 2 hours north. Those towering red rocks were like nothing I had ever laid eyes on before; seriously, a hiker's paradise. We ended up finding decent lodging using the app HotelTonight. We weren't looking for anything spectacular—just a cozy spot to rest our heads for a night with convenient access to trailheads. 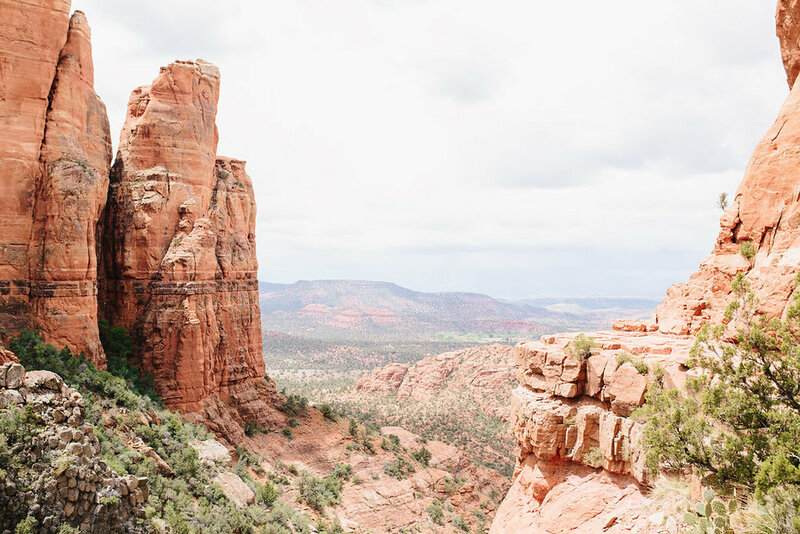 What we quickly realized is that Sedona is a town experienced on two extremes: either at a high-end spa resort sleeping on Egyptian cotton sheets, or at a campground pitching your own tent and falling asleep under a canopy of stars. There's not much in between. The next morning, we set off for the Grand Canyon. So spectacular, and amazing, and all those adjectives you've heard associated with it before. Pictures really don't do it justice. The scale. The magnitude. The way it dwarfs your ego and reminds you—quietly, powerfully—that it was around long before you arrived in this world and will remain long after you leave it. It's a portrait of God's steadfastness. It's all those things you imagine it will be. It's also a great (read: dangerous) place for handstands. Stevie tested his mortality and came out on top. From the Grand Canyon, though, things only got better. We assumed the best was behind us, when it really was ahead. Isn't life funny like that? We could have turned around and headed straight back for Phoenix, wide-eyed and perfectly content. But thank goodness we didn't. Thank goodness we turned back onto that lonely road and pressed on toward the hopes promised ahead. Check back next Wednesday for the second half of our trip! The cliffs, the caverns, and the most spectacular spot that we nearly missed.